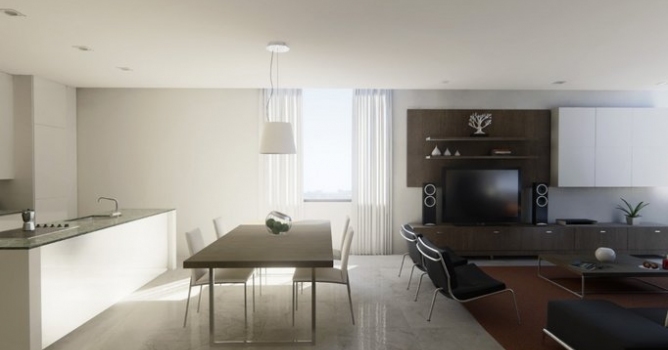 Check Evermotion Archinteriors for Unreal Engine. This tutorial was brought to you by UE4Arch: https://ue4arch.com. In the architecture visualization world we always seek to achieve a result close to reality to provide our customers the feeling of seeing the finished project. But generally we are limited to still images and videos of these environments. What if we could enter the rooms, open the doors, walk on it, turn on and off lights, change the decor and still maintain photorealism? That’s where Unreal Engine 4 enters. UE4 was recently launched in March 2014 by Epic Games as a powerful tool for creating games. 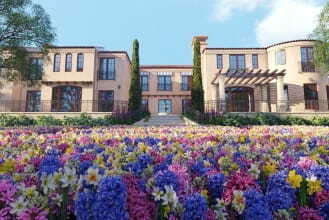 However, it is an application that can be very effective for architectural visualization. It still has some graphic limitations compared to conventional renders as V-Ray and Corona, but that does not prevent you from getting incredibly realistic results in real time. In addition to the powerful graphics render, UE4 has a visual scripting system (called Blueprints) where you can create multiple interactions without writing a line of code. With the Blueprints system, you can perform actions such as lighting on/off switch, open and close doors, change object’s color and material, replace models in real time, change the time of the day, create defined camera tours and much more: the limit is your imagination. It is also possible to work with particles to create extremely realistic effects like fire, smoke and water. Resuming: it’s a games creation software that can work perfectly for architecture and allows you to give life to your project with the possibility to navigate and interact with it in real time; and you can still do all this with a graphic quality comparabled with other 3D renders. Indirect lighting is another strong point of UE4. The engine has an improved lighting system where you can reach a similar workflow to V-Ray using a skylight to simulate the lighting coming from the sky and a directional light to simulate the sun. Sometimes it is also recommended to use spotlights (which work in a similar way of V-Ray light planes) at some points to get better lighting. First of all you need a good computer to run UE4 software. The recommended hardware by Epic Games is a Quad-Core processor 2.5Ghz or faster, 8GB of RAM and at least a GeForce GTX470 or AMD Radeon 6870HD Series, but we do recommend a better setup if you are planning to really work with UE4. The second thing you need is an Unreal Engine 4 subscription. You can sign up and find more details on their website. 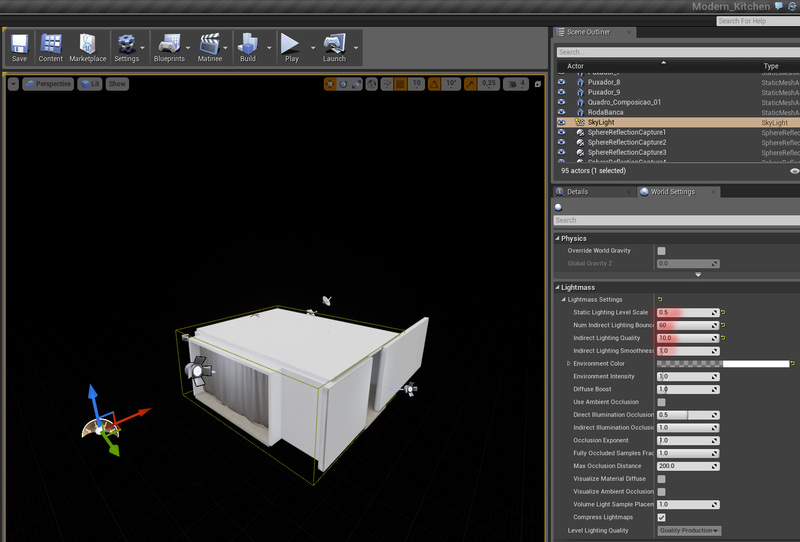 The workflow to create an architectural project inside UE4 is based on modeling and texturing assets in a 3D software (3dsMax, May or other), import in UE4 and then set the scene. So, you will need a prepared model or a 3D software to create your model. With this setup you are ready to start. Other applications may be needed for your project and i will talk about them later. In this article I will explain the process to create a basic interior scene, but also i do recommend you to read the documentation on the official UE4 website. In this documentation you can learn basic stuff and get used to the software interface. Preparing the assets in 3dsMax. I will use 3dsMax to start my project, first modeling the static objects of architecture: floor, wal'ls, ceiling, etc. It is important to rename each object as they will be exported separately. After modeling you should start the texturing process. All assets that will be prepared for UE4 should have open meshes and no overlapping faces. Then an extra UV channel should be created. The reason for this extra UV channel is because UE4 will use channel 1 as diffuse object texturing and channel 2 to bake the lightning map. If the faces are overlapping the lightmap will cause artifacts and will fail. In 3dsMax we can use the flatten-mapping method to open the mesh in primitive objects. This method works very well and is fast for this case. For more complex objects such as furniture, you should use other methods such as pelt mapping. After you set the static objects, i recommend to export each object with their proper names. To export the models to Unreal Engine 4 you should use the FBX format. The imported path of the imported asset depends on the current location of the Content Browser while importing. Make sure to navigate to the folder Appropriate prior to performing the import. You may also drag the imported assets into the new folder once import is complete. Choose the Appropriate settings in the Import dialog. The defaults should be sufficient in most cases. See the FBX Import Dialog section for complete details of all of the settings. 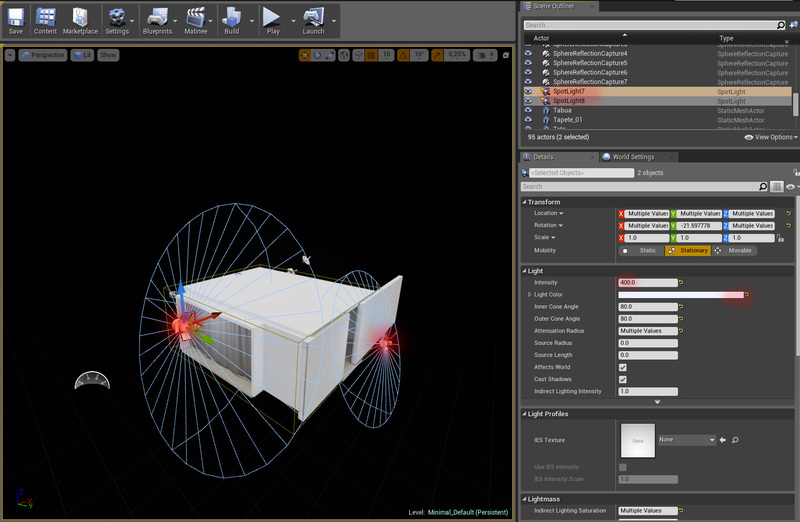 Click the button IMPORT to import the mesh (es). 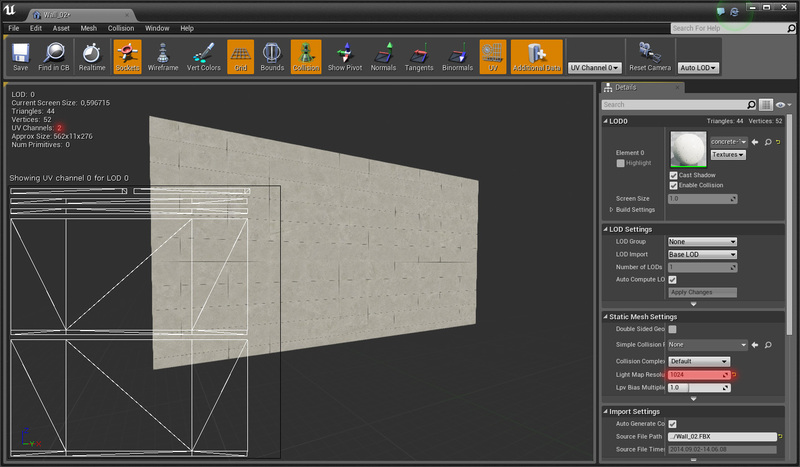 The Resulting mesh, material (s), and texture (s) will be displayed in the Content Browser if the process was successful. Although textures and materials can be imported with a static mesh, only Color and Normal will automatically be connected (assuming the supported equipment was used in Max / Maya), Specular maps will be imported but not connected, other maps, like Ambient Occlusion map in the Diffuse slot of the Mayan material, would not be even imported; it is best to check your materials and connect any unconnected maps and check which maps did not import. Simply double-click the new equipment and connect the available textures into Their Appropriate inputs. By viewing the imported mesh in the Static Mesh Editor and enabling the display of collision, you can determine that the process worked as expected. Alternatively, you can just click and drag an FBX file from Windows into the Content Browser and it will bring up the import dialog for you. The import steps list is from the official Epic Unreal Engine documentation. It is important to organize your content browser folders with the correct names. In this case we use the name Static Architecture for our static objects. After importing the files to the content browser go up to the top viewport and drag all models at once (use CTRL to select more than one object). 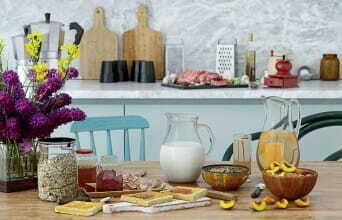 This way you can import all objects to the scene in the correct position created on 3ds Max. After setting up the first part of the scene in UE4, you should import other assets like doors, furniture, adornment, etc. For these assets we should align their pivot point to 0. This is because Unreal Engine recognizes the pivotal point in 0 and if your object was imported away from the origin, you will have difficult to handle it in UE4. 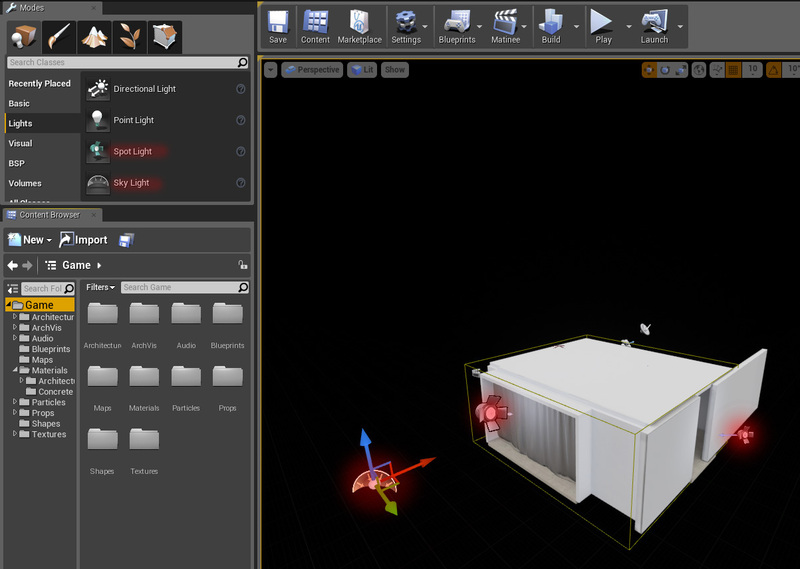 The next thing after importing the assets is to relocate them into the scene: within the Content Browser (Ctrl + E), we will adjust some settings for each object. In Lightmap Size option will be set the lightmap size of each object. The higher this value is, the longer is the lighting calculation time as well as the shadows, so I recommend using a value of 1024x1024 for extended objects (walls, floors, ceilings etc) and values between 128x128 to 512x512 for smaller objects (adornment, furniture etc). In this window we can also see the number of textures channels and view the UV mesh. When the materials window is opened, you will use similar concepts to conventional renders to represent the desired materials. You should use the Nodes concept, which will link parameters as Textures, Texture coordinates, normal maps, etc. 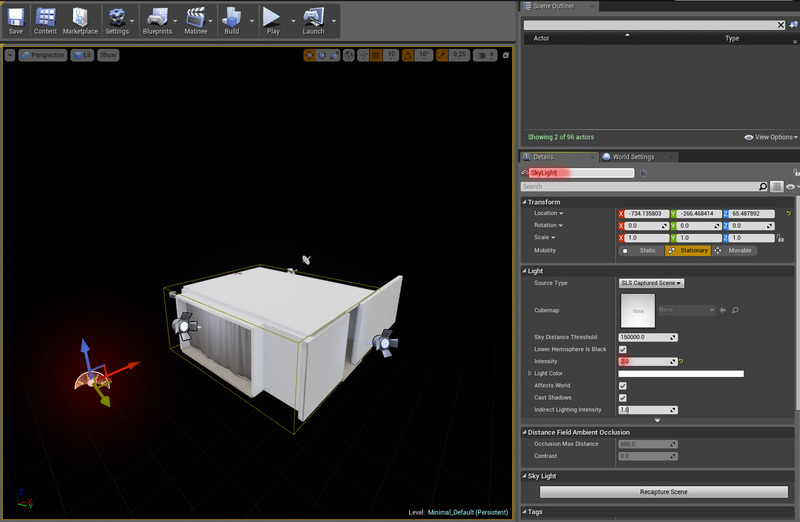 When importing a texture to UE4, we can drag it into the materials window and connect to the Diffuse parameter. 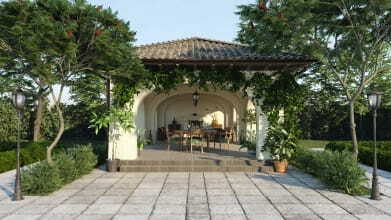 We will do this for parameters such as specular, reflection and normal. I will not go further into the creation of realistic materials within UE4, but you can see good examples in our complete projects. Also there will be a video course about these in the near future. To create normal maps into your textures I recommend using a Photoshop plugin from nVidia "NormalMapFilter". To begin this part, I recommend start testing the lighting only with part of the static architecture (walls, floor and ceiling): this way the lighting test time is reduced and when we insert the furniture, the lighting will be very polished. First insert a Skylight and start testing the intensity value. I suggest not to exaggerate this value to more than 2. To test the basic lighting click in Build > Lighting quality > High. Spotlight settings on the right. In this demo scene i configured my Lightmass (engine used to calculate GI in UE4) with the above parameters. After many tests we came to these values to get free illumination spots (splotches or flickers). But remember that each scene should have a particularity. After figuring out the lighting and reaching the desirable effect, you will add a post-process volume where you will have more control on the visual of the scene. In this step you will be able to add Bloom and Vignette effects, control the Exhibition, Depth-of-field, color correction and more. You can check everything in our complete projects and keep reading the Unreal documentation to experiment different settings. Thanks for reading! This tutorial was brought to you by UE4Arch: https://ue4arch.com. Optimizing V-Ray settings tutorial by Grant Warwick. Breakdown of awesome interior scene from Archinteriors vol. 35. With a slew of lighting and material improvements and huge updates to animation workflows. Thank you for this tutorial. Very helpful and interesting! is compatible vray scene and unreal engine 4 ? in particular textures? Obrigado, muito superficial mas bem esquematizado e directo, de facto existe falta de explicações / tutoriais para esta vertente especifica ( arquitectura ), seria óptimo criar, evitando a enorme e confusa diversidade de opções do programa, e quem quiser saber mais bem... não faltará certamente informação diversa para jogos etc. Bom trabalho. my 3ds max unit setup and Unreal Engine 4 unit setup not match......... ???? I opened an empty project/ empty level and added an skylight. But nothing happened. everything stays black after light building? !